Well, too bad, young me, I’m gonna be an unrepentant cheek-pincher. I shall make the obvious, dorky observations, embarassing my young relations, and they will seethe. And then, someday, they will make those very same observations. It’s all part of the Great Wheel of Embarassment. More insidious is the urge I’ve been feeling to bother expectant mothers. I used to be scared of babies. For one thing, how do you hold them? They’re wriggly! What if you drop them? What if they explode, or pee, or something? Of course, that all changed with daddy-hood; now, I view babies as a kind of highly entertaining bean bag, usually with good smells and laughing (usually.) If it’s your baby, you know what to do when the baby starts crying. If it’s not, you can jolly well just hand it right back again. So that’s good. So I’m not scared of babies any more, but I also have stopped viewing expecant moms as an atomic unit and started seeing them as a molecular collection of units. When Kate was pregnant, I pretty much just saw her as Kate, but with a new, pregnant shape. But still all Kate. Seeing Lydia born changed all that: “holy cow, there’s ANOTHER PERSON in there!” So now when I see a hugely pregnant woman in the train station, it’s a lot easier to realize that there’s a little upside-down, curled-up person hanging out on the station platform, too. What the hell is wrong with me? Maybe nothing, since that seems to be a common horrifying behavior, the complete-stranger-handplant-and-shout. Dear God, I hope I can exercise some restraint in this regard. I’ll go pinch some cousin’s cheeks instead. I took Wednesday off of work to help my dad and stepmother move houses, from Mount Airy, Philadelphia, to the house that’s just across the street and a few doors down. My brothers Oliver and Sam (my stepmom’s sons) are in town from Milwaukee and Albuquerque, too, and they’re busy working on the Benson Family Basement Archive of Simultaneously Extremely Heavy And Very Delicate Items. It’s a burden they bear philosophically. And with many shipping blankets. Sam gave me a gray military tripod we found in a corner of the basement; it turns out to be a 1945 US Navy signaling searchlight mount, and it’s perfect — freaking PERFECT — to support the heavy green Eiki classroom film projector I bought on eBay for the Guerilla Drive-In. Man, I’m excited about this. The tripod weighs about forty pounds on its own, is made of hardwood and turned brass, and has spikes to anchor it in turf. I’ll need to make a plywood mount that screws into the tripod’s brass head (and to which the projector can be clamped.) Once that’s ready, I’ll be the mil-spec-innest AV geek on the block! Of course, it’s anybody’s guess whether the projector will actually, you know, work. It got pretty dinged up on its trip to me from Ohio. It seems to run okay, with a loud clattering noise and that hot, greasy, dusty smell that I was looking forward to. I took some pictures of the bent bits and sent them to KMR Electronics in California, where a guru named John has been working on Eikis for twenty-three years, and had plenty of good advice for me. Now I just have to wait for the print of Ferris Bueller’s Day Off to arrive from Chicago to know whether this summer will be filled with outdoor movies, or, um… not. My brother Oliver is in town from Milwaukee; he and my other brother Sam are going to help my dad and stepmom move into the house a few doors down the street. When I got home tonight, Oliver had mostly finished a pastoral mural in the downstairs bathroom, of rolling hills with a Jefferson-y style building in the distance. The tree trunks in the treeline are done with a palette knife, which is pure Bob Ross. Oliver likes to riff on Bob Ross; I have a canvas of his with a craggy mountain overlooking a pine-rimmed lake (the pine trees have pallete-knifed trunk), and in the water is floating a giant eyeball. I briefly considered hanging it in the nursery. 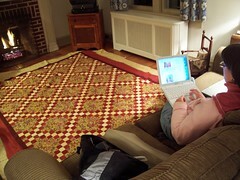 Kate is completing a double Irish chain quilt, which is spread out to its full size on the floor. The top is now fully pieced and borders are assembled. Kate pieced it using a strip quilting method, which means that she totally, like, matrix algebra-d together the thing by creating repeating sets of strips that stack on each other to make the diagonal chains. Lydia likes to jump up and down in her jumpy chair. She goes jumpa-jumpa-jumpa, then stops and dangles and chuckles for a while, then goes jumpa-jumpa-jumpa again. The Ultimate Water Gun came back from its trip to freshman orientation at the University of Toronto Engineering school a few months ago. In accordance with a (slightly batty) British tradition, students paint themselves purple. That’s the best kind of tradition, frankly: both Batty and British. Anyhow, frosh wear yellow hard hats and are subject to the normal indignities, like getting pummeled with a head-mounted water cannon. It’s the time of year when the Ultimate Water Gun loan requests are starting to come in at the rate of one or two a day, so I thought I’d nag Michael, the orientation leader, to send along the pictures they took last august. Michael, in his purple at the podium at right, came through in spades. I’ve got to give the photos a place of honor on the Ultimate Water Gun Accomplishments page, as soon as I’m done making up outrageous lies about the pictures and everyone in them. (I already retouched the hell out of the bottom photo to make the stream look stronger, since I have absolutely zero journalistic integrity.) Click the images to enlarge. Thanks, Michael! May your tub ring always have an indigo hue! Quilting is an interesting hobby; it takes a lot of planning and a lot of patience; a quilt project can easily span a year or more. And there’s several different skills to master: color theory and an eye for selecting fabrics, the piecework necessary to put the quilt top together, and the skill to quilt the top, the batting, and the back together. My mom used to say that my grandfather’s hobby of fly fishing was “a hobby for men with exacting professions,” since fishing required mastery of a lot of little, individually difficult acts. Quilting seems to be the same way, at least in that there’s a number of different hard things to learn. None of this stuff is particularly easy. It’s takes just as much learned skill to cable a sweater as (for example) it would be to shoe a horse, or carve a dovetail joint. I naively thought that there were some basic skills that underlied everything, but that’s not the case — there’s a large number of quite difficult skills to learn. And you often see people doing things that are hard, just because they can, as you would in any other human activity. None of this stuff is particularly cheap. That seems to be a no-brainer in modern times (you expect that hand-carded wool, for example, would cost an arm and a leg, because it’s a vertical market item), but the nineteenth century Amish quilts that you see in Lancaster weren’t made with hand-me-downs, either. While it’s true that some of those quilts were made with dress material, they weren’t scraps or leftovers — women would buy large amounts of the high-quality dress wool to use to make quilts at the same time as they bought material for the family’s clothes. So, I’m not sure what the surprise is, here: people think that traditional women’s crafts are easy and cheap, and it turns out that they are actually quite difficult, and can require expensive tools and materials. Gloria Steinem was absolutely right; in men’s hobbies, we BRAG about the special knowledge and ruinous expense required, as we roam the carpeted hallways of the Javits center, looking for fifty-dollars-a-gram molybdenum grease. Well, that’s not quite right. I belong to a bike clique where you’re expected to do your own maintenance, and you should really demonstrate need before shelling out for the top-of-the-line boots. So I’ve got the tank off of my thirty-year old Teutonic workhorse of a bike, which has given it a dejected, swaybacked air. I’ve pulled the brake master cylinder in hopes of getting it cleaned, fixed, and rebuilt before the first really nice day of spring. It shouldn’t be too hard, despite Haynes’ manual’s insistence that what I’m about to do isn’t possible. Psssh. I’m writing this blog post, however, in Kate’s sewing room as I’m watching her piece together strips of material in a “10001” | “01010” | “10101” | “01010” | “10001” pattern that will eventually result in a double Irish Chain, and I have to admit, at least for tonight, that her hobby has pwned mine. * It occurs to me that the big quilt show in Houston is held in a big, carpeted convention center, and that permed ladies from Jersey do drop sixteen large on big-iron quilting hardware, so there goes my Virginia Woolf connection.